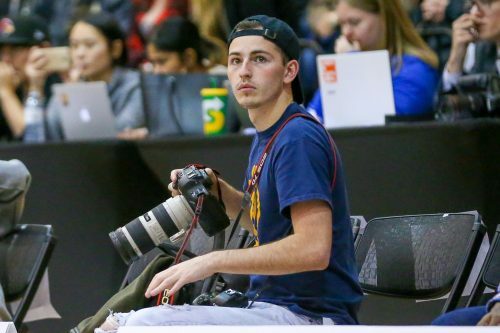 If you’ve ever been to a Ryerson Rams game, you’ve definitely caught a glimpse of Alex D’Addese, one of Ryerson Athletics’ photographers, running around in search of the perfect shot. Often seen with cameras draped around his upper body, the upcoming 2019 grad has shot over 600 events in and around Ryerson. D’Addese practically lives at the Mattamy Athletic Centre (MAC), and he’ll be the first to tell you that he loves it. Even though he considers himself an “above average house-league [hockey] player, at best”, he’s always watched the Toronto Maple Leafs and Raptors with an interest in learning the way the industry worked. 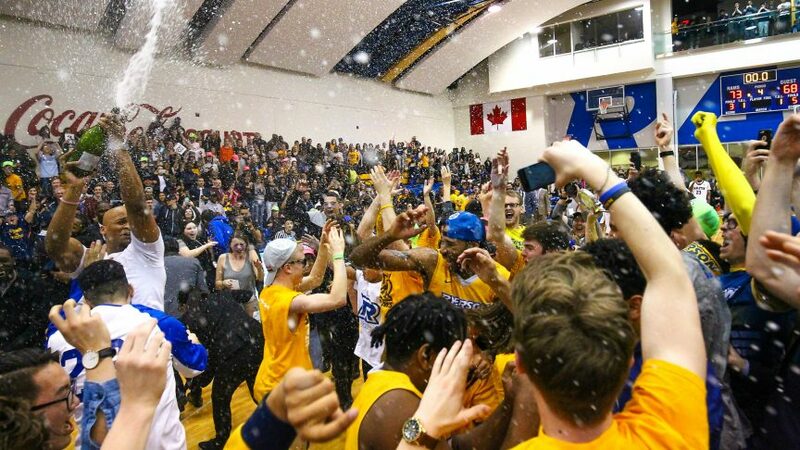 After one year of studying Communication, Media and Film at the University of Windsor (where he dabbled in sports photography, shooting Windsor’s football team for the 2013-14 season), D’Addese transferred to Ryerson and took a job as an event photographer in his first year. Since then, he’s landed gigs shooting International Ice Hockey Federation (IIHF) World Junior Championships, National Basketball Association (NBA) All-Star Games, and the 2018 Summer Youth Olympics in Argentina, among others. He was selected out of thousands of applicants to shoot the Youth Olympics. He’s also shot nearly every game for Ryerson’s men’s and women’s volleyball, basketball, and hockey teams—frequently travelling with the teams to tournaments and championship games, both provincial and national. D’Addese’s pre-game rituals, which begin several hours ahead of an evening game, are something to behold. Perched on his wheeled stool on the far-right hand side of the media desk at the MAC’s Home Ice, he sets up multiple cameras and walks around the arena before heading down to ice level to capture the team’s warm up or shootaround. Perhaps even more staggering than the photos themselves is D’Addese’s remarkably humble and relaxed attitude towards what has been an illustrious career thus far. He’ll never go out of the way to show off a slick shot or brag about the connections he’s made. That’s part of what makes it so easy for athletes and colleagues to get along with and respect him so greatly. As for his future career, he doesn’t think about it too often, at least not in a self-fulfilling and idealistic sense. He enjoys what he does, and if a professional team is looking for a team photographer, he’ll be the first one to run with the opportunity. Still, he’ll never forget the half-decade he spent at the MAC.